Die Mixe für die Dokumentation unserer Live-Tour 2012/13 sind endlich fertig. Leider hat es etwas länger gedauert, da wir für die Aufbereitung von so viel Songmaterial auch entsprechende Studiozeit benötigten, die wir aus Kapazitätsgründen und in Abstimmung mit der eigenen Verfügbarkeit in mehreren Etappen nehmen mussten. Somit hat sich das Ganze über einige Monate hingezogen, aber der Aufwand hat sich gelohnt, soviel können wir schon jetzt versprechen! Es gab ihn aber letztlich immer, den ultimativen Take, das absolute Highlight der Tour, welches nun den Weg auf Tonträger findet, und ich habe mich sehr ins Zeug gelegt, um auch jede Feinheit beim Mix der einzelnen Spuren herauszuholen, die vielleicht im Wall of Sound des jeweiligen Venues nicht immer und überall so klar und definiert zu hören waren. Enge Freunde, die mich bei meiner Mixarbeit, assistiert von den Toningenieuren Arne Neurand und Mirko Hofmann, im Studio besuchten, waren sogar der Meinung, dass manche Liveversion eines Songs die Studioaufnahme übertrifft, was mich ganz besonders freut, denn erstmalig konnten wir auf dieser Tour auch ein Line up aufbieten, welches es uns ermöglichte, wirklich alle Titel authentisch und ohne Kompromisse zu performen, und dies durchweg mit Musikern, die sämtlich, teilweise in verschiedenen Epochen, die Musik als feste Mitglieder der Band auch schon auf den Alben mit geprägt haben. aus den Plattenproduktionen auch live abbilden zu können, und letztlich auch noch die Original-Gastsängerinnen aus den einstigen Studio-Aufnahmesessions dabei zu haben, die durch die großartige Solistin Alexandra Seubert noch ergänzt wurden, hat uns enorm euphorisiert und ein einzigartiges Wir-Gefühl hervorgebracht, welches uns durch die gesamte musikalische Retrospektive unseres mehr als 2 1/2 stündigen Programms begleitet hat. Abschließend gilt unser Dank noch einmal allen, die bei den Konzerte dabei waren, und die dadurch dieses erste Live-Statement auf Tonträger seit mehr als 30 Jahren erst ermöglicht haben. Jeder Abend war für uns ein Event voller Emotionen und Leidenschaft, bei der alle, angefeuert durch eine einzigartige Stimmung, alles gegeben haben. Wir wünschen Euch viel Spass mit REINCARNATION ON STAGE. the mixes for the documentary of our live tour 2012/13 are finally finished. Unfortunately, it took a little longer because we needed corresponding studio time for the preparation of so much song material, which, due to capacity constraints and our own availability, had to be done in several stages. So the whole thing has gone on for some months, although we can already promise you that the effort was worth it! Even while listening to all the concert footage we were aware of what a unique, almost magical atmosphere we shared with you throughout the tour, and it was often difficult to pick out the best version of each track for our live documentary. But there was always, ultimately a definitive take, the absolute highlight of the tour, which has now found its way on tape. I have put my back into the work in order to draw out every subtlety in the mixing of each track, which possibly in the Wall of Sound at the respective venues was not always clear and defined enough to be heard everywhere. Close friends who visited me during mixing, assisted by the engineers Arne Neurand and Mirko Hofmann in the studio, were even of the opinion that some of the live versions of the songs surpassed the studio recordings, which I was particularly pleased about because, for the first time on this tour, we were able to muster a line-up which allowed us to really perform all the songs authentically and without compromise, and this consistently with musicians, all of whom, partly in different eras, have also shaped the music as permanent members of the band on the other releases. The luxury of having two guitarists and two keyboardists capable of reproducing almost every musical and tonal detail from the original recordings live, and ultimately also to have the original guest singers from the former studio recording sessions there, complemented by the superb soloist Alexandra Seubert, has given us a euphoric and unique sense of belonging, which accompanied us through the entire musical retrospective of our more than two-and-a-half-hour program. Finally, our thanks once again to all who were present at the concerts and who have made this first live recorded statement for over 30 years possible. Every night was an event full of emotion and passion, in which everyone - inspired by a unique atmosphere - gave everything. The album will be released as a double CD, covered in a high value 8-page digi pack on January 17th 2014. 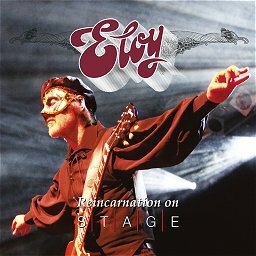 Pre orders can be made in the Eloy shop from November 22nd 2013 on http://www.eloy-legacy.com. We wish you lots of fun with REINCARNATION ON STAGE. endlich - sehr schön. wenn auch noch nicht techtzeitig als weihnachtsgeschenk erschienen, so ist zumindest die vorbestellung bis dahin möglich und damit der virtuelle besitz und träumen zur vorfreude erlaubt. Großartig, endlich wieder was, auf das man sich freuen kann. Vorbestellungstermin ist vorgemerkt! Frank told me, that after 74 days of mixing (with breaks inbetween) he will start the Mastering of the album this Monday. So the songs were taken from different shows in 2012 and probably 2013 ? Likely we will know from the CD booklet! Frank decided not to publish the venues where the recordings come from. (06.12.2013 10:43 AM)Robin Wrote: Frank decided not to publish the venues where the recordings come from. That's a bit of disappointment for all of us who were present at the concerts... . At the end, it is not something that counts too much, but it is different to listen a track and know that you were there when the song was performed..
Have the tracks from different venues been spliced together, so it all sounds like one complete concert, or has the crowd noise not been added. Third option (in my opinion the worst) are there fades in and out between tracks from different venues. Waiting for it anyway ! !